These are the geldings of KSW Farms. We don't have a lot of geldings because this is a breeding operation after all. But the geldings we do have were either bred by us or for us. Any former stallion that's now a gelding, their foal records will be listed on the correct stallion page and will be noted here. 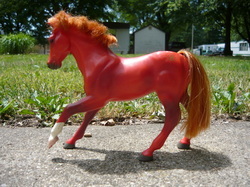 Jazz Baby-2000 chestnut Arabian. Sired by Sultan Pepper, out of Acapella. Product of a brother/sister mating. Stud record can be found on the Arabian stallions page. Southwind Baron-2008 Flaxen red chestnut Thoroughbred. Sired by Economic Brigade, out of Hide N Seek. Bred by Pied Piper Ranch. 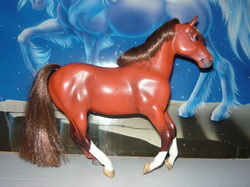 OF GC Dutchess with slightly trimmed mane and tail. 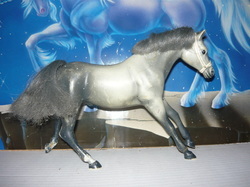 KSW Duke-1994 dapple gray Thoroughbred. Sired by Figure, out of Skydancer. OF Grand Champion Stormy Skies. Raced from ages 2 to 9. Fog is a 2015 unknown breed gelding. He came to us a rescue. He was a yearling when he came to us and a colt but we have since gelded him. Even though he had a horrible first year before we got him, he's still very sweet and willing. He loves peppermints. So if you ever visit him, be sure to bring some. He will shove his nose into pockets looking for them. Pic credit @ Kelly Marlett.